Amazon AppStream 2.0 now supports Google Drive for G Suite as a user storage option. You can integrate your G Suite account with AppStream 2.0, and your users can easily link their G Suite accounts to access their files on Google Drive inside their applications like they would on a Mac, PC, or Chromebook. You can integrate your G Suite account with AppStream 2.0 for no additional charge in all AWS Regions where AppStream 2.0 is offered. However, AWS data transfer charges will apply to any files created or modified with AppStream 2.0, and then synced to your users’ Google Drive. You can enable Google Drive for accounts in G Suite domains only, not for personal Gmail accounts. Now that we’ve covered the basics, let me show you how to get started with Google Drive for G Suite on AppStream 2.0. Enable Google Drive for your AppStream 2.0 stack. Add AppStream 2.0 as a trusted application to your G Suite domain. Connect to Google Drive as a user and test. An AppStream 2.0 stack with an active associated fleet. An active G Suite account with a valid organizational domain. User accounts within the domain to use with AppStream 2.0. If you want your users to also be able to access AppStream 2.0 using their existing G Suite credentials, read Setting up G Suite SAML 2.0 federation with Amazon. If you are new to AppStream 2.0, see Stream Desktop Applications. You can enable Google Drive for a new or existing stack using the AWS Management Console for AppStream 2.0 or the Amazon AppStream 2.0 API Reference. In this post, we use the AppStream 2.0 console. Log in to the AppStream 2.0 console. Choose Stacks and select a stack. In the stack details, choose Enable Google Drive. In the dialog box, provide up to 10 G Suite domain names to connect with AppStream 2.0, and choose Enable. Before notifying your users that they can use Google Drive, you must add Amazon AppStream 2.0 as a trusted application in your G Suite domain. Under API access, choose Trusted apps. The next page displays the list of all third party applications that you trust to have API access to your G Suite domain. 3. To add a new application, choose Whitelist an App (+). 4. 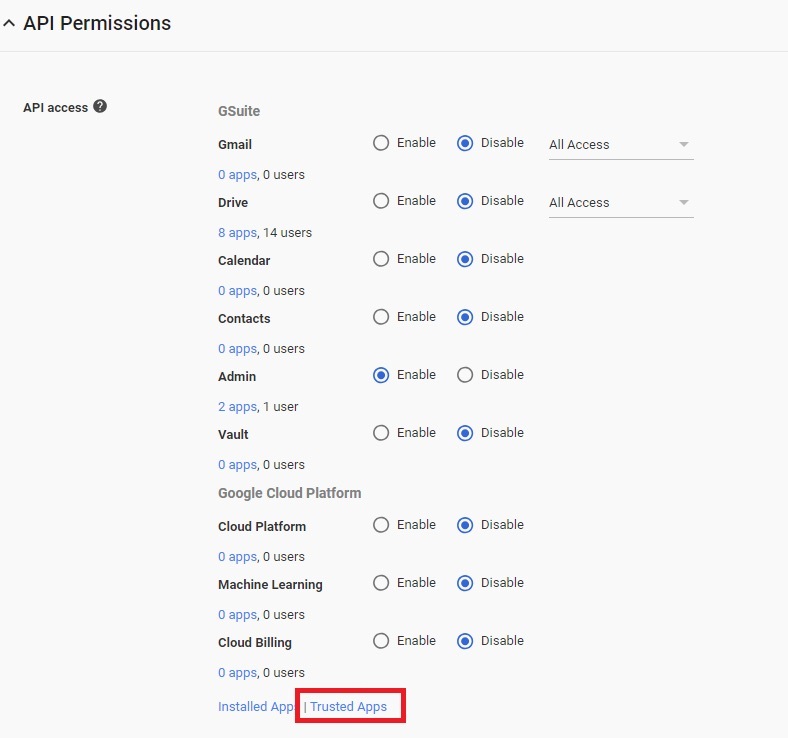 In the Select App Type list, choose Web applications and enter the OAuth client ID (the AppStream 2.0 application ID). For the right regional AppStream 2.0 application ID, see the next section. Amazon AppStream 2.0 has a unique OAuth client ID for every AWS Region where AppStream 2.0 is available. You can add all the regional apps or choose to add only the regions where you have AppStream 2.0 resources. You must first create a streaming URL for the stack you just configured before you can connect Google Drive as a user and test. Choose the stack and select Actions, Create Streaming URL. Provide a user id and an expiration time for the URL, and click Get URL. A one-time streaming URL will be generated for the user id provided. Choose Copy Link to copy the link to the clipboard. Launch the streaming URL in a browser and select an application from the application catalog. Once you are connected the streaming session, choose My files from the session toolbar. Click Add Google Drive and choose the domain for the G Suite account you want to link. Now, you can sign in as a user. Choose Allow to provide AppStream 2.0 access to your Google Drive files. You only have to link your Google account once. AppStream 2.0 will automatically connect to your Google Drive for sessions you launch. Once authenticated, your Google Drive will be listed as a folder under My Files. Click the folder and browse through your files. Google Drive will also be listed as a folder option within an application. You can access all your existing files including your personal files stored under My Drive, shared files stored within Shared with me, and Team Drives. You can remove AppStream 2.0 as a trusted application from your G Suite account at any time from the permissions page. Sign in with the account that you have linked with AppStream 2.0. You will see Amazon AppStream 2.0 listed as a third party app that has permissions to your Drive. Click Amazon AppStream 2.0 and choose Remove Access. Now, your users can access their files on Google Drive like they would on any Mac, PC, or Chromebook. If you’d like to learn more about this feature, see Enable and Administer Google Drive for Your AppStream 2.0 Users.